MADRID - Simon Yates has won his first Grand Tour title after a largely ceremonial ride into Madrid in the final stage of the Spanish Vuelta on Sunday. MADRID - Simon Yates won his first Grand Tour title after a largely ceremonial ride into Madrid in the final stage of the Spanish Vuelta on Sunday, giving British riders a sweep of the season's three biggest races. 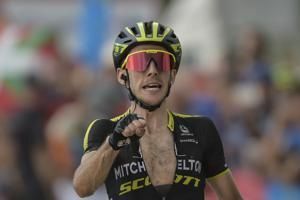 MADRID - English rider Simon Yates wins Spanish Vuelta for his 1st Grand Tour title.